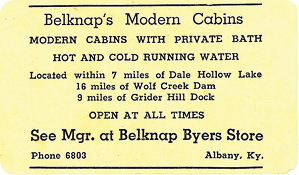 The neon sign on Wood Street, just off the main street in Albany said “Belknap’s Cabins and Tourist Home”. It hung at the end of a row of concrete block “cabins”, one section built to face west and another facing north, that one just a few feet from the Albany First Baptist Church, affording a discreet hiding place for many things best left unseen. There was a walkway between the cabins, affording easy access to the church or the nearby pool room, whichever path you might prefer. There was a large white house on the lot as well, where Belknap Byers and his wife Annie lived. Belknap bought the house from W.G. (Bill) Armstrong in 1939.Previous owners included J.B. Leonard, Dr. Ryan, J.E. and Newman Morgan, and local banker-attorney Elam Huddleston, who sold it in 1919 and moved to Louisville. He became big in Democrat politics-for a while, being elected State Treasurer in 1931. This was the “Tourist Home”. Belknap took in boarders-some lived in the house; some, which Belknap might deem not appropriate for residing in the home amongst the Byers family, rented the cabins. Folks would drift into Albany and find a home at Belknap’s, or some local folks would live out their years there, or just stay a while. Some of those residents were Lee Bray (Annie’s “gofer”, she only looked Chinese), Jean Cranston, Brad Hancock (whose claim to fame was being in the Nashville Jail with Buck Owens), Belknap’s nephew Clyde Sandusky, Bill Phares, Willard Smith, Ed Maupin, Shorty Hudson and so many forgotten others. For forty years Belknap also ran a throwback general store on the west side of the town square, and stepping into it was like stepping back in time. He also owned over forty rental properties, including the theater in Byrdstown and the skating rink in Albany. Belknap had one son, Belknap Byers Jr. (The name “Belknap” came from the Republican nominee for Governor of Kentucky in 1903, Colonel Morris Belknap of Belknap Hardware.) “Junior” was how he was known and he was known by all. Everybody in town knew little Junior Byers, whose world as a child extended from Belknap’s store to the Baptist Church and their adjacent home and the three blocks north to the school grounds where Junior could walk and attend from first to 12th grade. In his senior year of high school, Junior made it known that he wanted to go to college at Western Kentucky University. Belknap, uneducated and frugal, was of course concerned about the cost. One day Leonard Wilson, a Jamestown attorney, brought his brother-in-law, Dr. Crawford Crowe, to Albany. Dr. Crowe was head of the History Department at WKU. They stopped by Belknap’s store, which was Leonard’s routine. Leonard made introductions, but did not anticipate Dr. Crowe’s position meaning much to Belknap. But on the contrary, Belknap perked up and had questions about college and particularly its cost. Dr. Crowe told Belknap how much tuition was and the cost of books and meals for a semester. Belknap wanted to know how long it would take to complete school and Dr. Crowe advised that a diligent student should complete their course of study in four years. Belknap then asked what the total cost for four years of study would be and Dr. Crowe did some figuring and gave Belknap a figure which was quite substantial. Junior did put in some time at Western, or in the vicinity of campus, and somewhere along the way got interested in music, and particularly playing the drums. He was to become a major figure in the history of the local music scene in Albany and the region. Junior loved to be around people. He never met a stranger and would take just about anyone in as a friend, a trait likely developed when new people would suddenly appear at the Byers home and would become part of their extended family. He recognized the abilities of David Pennycuff ,who had moved to Albany from Indiana, and who was a gifted vocalist and stage performer. They were in several bands together and Junior was in other bands as well: The Cutaways (Junior on bass, Lynn Avery on drums, and Mike Lawson on guitar was the first), then The Mystic Sounds, Cold Feet, Kan-tuck, Voyager, The Critters, and The Hoss Band, playing with scores of area musicians. Junior also played drums on Cecil Pryor’s singles as well as the WANY DJs records and played many a gig with Darrell Speck. He played all across the south and occasionally fronted major acts. There was also that memorable night in Bowling Green in 1980 when the night before REO Speedwagon and Point Blank were to play at Diddle Arena, they showed up at the Brass A Saloon downtown to jam with Junior and the boys. Jerry Perdue, the gentle giant, was often a part of the tour, and Junior would warn unsuspecting strangers to watch themselves around Jerry, as he was dangerous and liable to go off anytime. Junior liked to tell big tales, but there was never any harm in them. 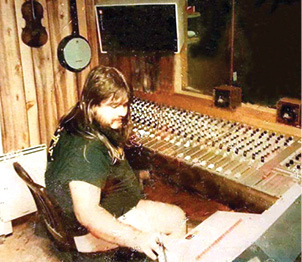 Before Belknap died in 1978, Junior decided to start his own studio, and walls came down in the cabins and J. Byers Recording Studio and Wood Street Publishing were born. He recorded many acts there as well as his own bands. During this time it seemed like there was always someone hanging out at Junior’s, just the way they did when Belknap ran the place. But there had always been folks hanging out at Junior’s – and not just the neighborhood boys, who in those days were numerous. He later partnered with David (Red Mule) Piercey and upgraded to a high quality sound studio. Junior Byers passed away a few days ago at age 69. He was a character, raised in a place full of characters. Jovial, colorful, and memorable. He loved to cook and he loved to eat. He loved music, but more than that, he loved people, and he loved his hometown. Being a musician insured that people would be around, and that’s what Junior wanted. If he ever had an enemy it wasn’t because he wanted one. He at times acted like a tightwad, but was actually generous to a fault. I sure wish somebody had saved that old neon sign. But it, like Belknap and Junior, will have to remain a memory.